Is picking up poop a hated chore? Well, introduce yourself to Poop Freeze. It freezes animal waste to -62F, so it creates an outer “crust” and makes it easier to pick up all kinds of poop including the not so pretty poop (aka diarrhea). It’s earth friendly and you can use it indoor or outdoor (poopsicle anyone?). 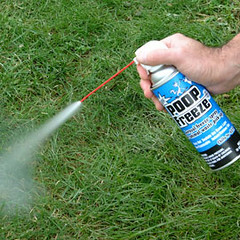 One customer reviewed Poop Freeze and said that Poop Freeze “actually makes picking up poop fun!” Wow… this must be some amazing stuff. This entry was posted on Thursday, May 10th, 2007 at 3:54 am	and is filed under National Dog, Cat & Pet Info. You can follow any responses to this entry through the RSS 2.0 feed. Both comments and pings are currently closed. Funny and practical. Yet kind of pathetic at the same time. Why not just use a poop bag? I could see this MAYBE being useful indoors in case of a splattery mess, but I could also see it damaging the carpet more than the screaming poo would. And outdoors… well who cares? You can hose away what you can’t pick up or just wait for a good rain. I can never see picking up poo as a fun hobby unless I was paid a lot of money to do it. Poop bag generally works fine, though, and I can’t see that this poop-freezer would eliminate the need for it. Knowing what it is like to clean up after dogs who have had some serious “runs”, this looks like an interesting product. Living in Northern CA. where it rains most of the time the old poop freeze looks like a handy thingamagig. I think I would sneak out to do the freeze thing when the neighbors werent looking over the fence…..